Then I got to thinking- it is a cookie sheet after all. Maybe I should make cookies. So I found what I thought was the perfect chocolate chip cookie clip art and printed out 10 cookies. As a toddler who loves cookies, he thought it was pretty cool to have cookies for on his cookie sheet. It also makes a great addition to his play food. He plays. We can count the cookies as he places them on the tray. Can you tell he likes them?! Toddlers love magnets, they're inexpensive, and can be a great learning tool. 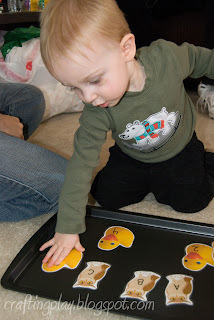 What creative ways have you found to use cookie sheet magnets?